It seems like Nokia is really aiming its new products at users, wishing an easy text input. After the not-so-businesslike-oriented E63 has been announced, a new clamshell with a half-QWERTY keyboard is expected. As a whole, the phone reminds us of the BlackBerry Pearl Flip, but looks a bit more elegant. The specifications are nothing special – 2.2-inch internal display with a 16 million color support. The external one is only just about 1.36 inch. 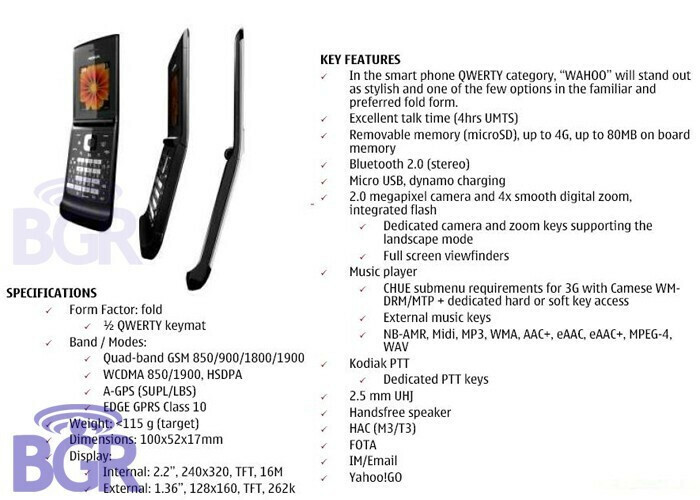 The phone is equipped with a 2MP camera with a flash, stereo Bluetooth and a 2.5 mm jack. The good news is that it’s going to be a global GSM, and the bad news (this time for Europe and Asia) is that it only supports the 850/1900 3G bands. Resources indicate that it’s also going to be offered by AT&T, whose 3G network uses these exact bands. There still isn’t a release date or a price, but we hope that official info about the market coverage will be available soon enough.